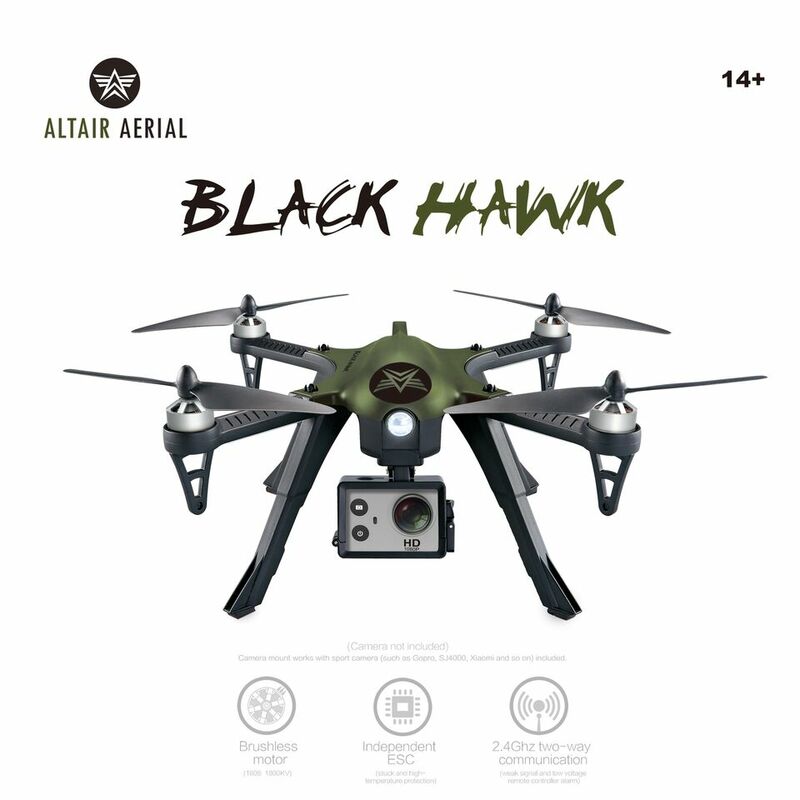 The Altair Blackhawk is one of Altair Aerial’s the quickest and most durable drones. Unlike the AA108 or the Hornet 818 Plus, the Blackhawk is built for speed and distance and offers impressive speed, stability, and overall quality at an astoundingly low price. If you’re looking for a quadcopter that’s fast and fun to fly, look no further than the Altair Blackhawk. See the best price for the Blackhawk on Amazon USA, or Canada, UK, Australia & Other International Shoppers click here, see their International Shipping rates here. 2017 has been quite a year for Lincoln-based drone startup Altair Aerial. Earlier this year I reviewed the AA108, and it quickly became one of our favorite beginner drones here at Dronethusiast. That was followed up with an upgraded variant called the 818 Plus and now known as The Hornet, which was a more photography-focused version with impressive hover capabilities. And now, as we all prepare ourselves for whatever horrors 2018 has in store, they’ve released the simply-titled Blackhawk, which promises to be their most advanced quadcopter yet. 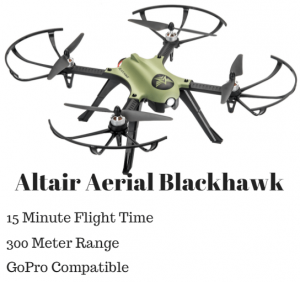 Unlike their previous two drone offerings, the Blackhawk is “built for speed and distance,” and since I’ve reviewed everything else Altair this year, I figured I’d take a look at this latest quadcopter and see how well it lives up to the promise of its predecessors. The AA108 and the Hornet came nearly pre-assembled, but the Blackhawk immediately stands out when you open the box and see a bunch of tiny pieces. Many of these are replacement parts (which you’re gonna want to keep close as we’ll discuss in a moment), but the Blackhawk also requires quite a bit of assembly at the start – it took me about 15-20 minutes or so, and you’ll need a screwdriver. That said, it’s all very straightforward – you just need to attach the landing gear, guards, and the propellers to the body, and the instructions are very clear and easy to understand. The Blackhawk is still reasonably beginner-friendly (I took it out with my little high-school-aged brother and he was able to fly it without much difficulty) but that’s clearly less of a focus here than it was with previous Altair offerings. So there’s no Quick-Start Guides or fancy controller inlets here – just you and the manual, though that’s more than enough if you know what you’re doing. There’s also no app features, so you won’t need a smartphone to get started. In fact, there’s no camera at all – just an attachable mount for an action camera. Important to note – unlike some of its competition, the Blackhawk doesn’t exclusively work with GoPros, but is designed to work with any similar action camera. The upshot, however, is that the drone is much quicker to actually start flying. Once the battery’s charged it’s extremely easy to connect the drone to the controller and take off. There’s plenty of extra buttons on the controller for adjusting the trim or other calibration effects, but I didn’t actually need any of them – everything seemed to work perfectly right out of the box, which was not at all the case with the AA108. Your mileage may vary, of course. If you’re looking for a similarly capable drone, with an HD Camera included, I’d suggest taking a look at the new Altair Aerial Tomahawk. There’s no fancy features here – no headless mode, no altitude hold, and no one-touch takeoff. You’ve got a stick that goes up and a stick that turns, and Altair is selling the Blackhawk purely on how fun it is to fly. Shape and Weight – Everything about the Blackhawk’s design is intended to give it the edge to fight the wind. To use one example: the Hornet’s propeller guards are designed for heavy-duty impact, giving the wind a large, aerodynamic shape to pull. The Blackhawk’s guards, conversely, are a lot thinner and have plenty of room for air to move through. Plus, it’s just a lot heavier. Brushless Motors – These make the drone a lot more quiet, if that’s really important to you. But more importantly, brushless motors provide much more power than their brushful counterparts – and that power translates directly into stability, letting the Blackhawk fight the wind and win. 6-axis gyro – standard on professional drones but a first for Altair. The 6-axis gyro keeps the drone steady even in harsher conditions. Plus, you can adjust the trim in all directions, allowing you to compensate if the drone starts to drift without input. But it’s not just stable. The Blackhawk is fast. Altair says it’s designed to feel like a racing drone, and while I don’t have any experience in that regard, it certainly feels like what you’d think a racer should feel like. Swoops and turns, dips and dives – and there’s actually a dedicated button that lets you pull of 360 degree flips. The Hornet was a thinking man’s drone, designed to let you carefully line up the perfect photography shot. The Blackhawk is exciting. It makes you want to try trick shots and quote Star Wars. Fortunately, that speed doesn’t come at the cost of control. I mean this in two ways. The first, quite simply, is that the drone controls extremely well – while it may be a bit intimidating to beginners, the new controller lets you have full control over even the tiniest movements. And when you push the sticks to a full tilt, the drone takes off like a bat out of hell. But the Blackhawk also has a 300 meter flight range, which means that it’s almost impossible to fly the drone out of the controller’s range unless you’re trying to do so. This is something that’s extremely important and often overlooked with fast, racing-style drones – it’s easy for them to zoom out of control, and that can be a real problem if the controller’s not powerful enough to keep the quadcopter in check. Altair, as always, has made a drone for drone users, not just something that seems like a good idea on paper. Finally, the Blackhawk also has a 15-minute battery life, though the battery takes significantly larger to charge than the Hornet’s (which has the same amount of flight time in a smaller package) and the drone only comes with one out of the box. Certainly not bad for a drone of this size – hell, 15 minutes is almost unheard of at its price range – but it’s hard not to compare it unfavorably to its predecessor. Still, considering the power necessary to get the Blackhawk in the air, perhaps it’s fair to give the battery a break. There’s a lot to love about the Blackhawk. It’s stylish, powerful, and a hell of a lot of fun to fly. It delivers on Altair’s promise to provide a more advanced alternative to the AA108 and the Hornet and shows that the company is ready to move beyond beginner quadcopters and into products that can impress even experienced drone enthusiasts. But one thing that really needs to get talked about is the price. Sure, it’s on sale right now, but even at its most expensive this is a drone that costs less than $160. For less than the price of the Hornet, a beginner drone that’s really only good for amateur photography, you get a drone that can keep up (quite literally) with the best of them, a drone with high-tech motor technology and a stable design that won’t quit. For that price, this is an amazing deal, and I highly recommend the Blackhawk to anyone who’s tried Altair’s other products and is ready for the big(ger) leagues. The Blackhawk is currently available from Amazon and retails for $129.80. The product ships out of Lincoln to the United States, as well as internationally to Australia, UK & Canada for $9.99 Shipping. Just bought one, but I can’t find a serial number anywhere. 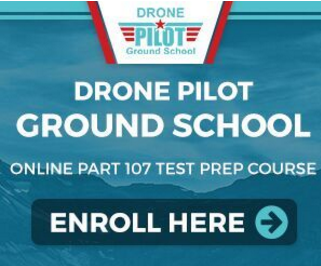 Don’t I need one to register with the FAA? Hi. although 300-meter flight range is mentioned, what is the maximum flying altitude? Good question! The motors on the Blackhawk are 1806 1800KV brushless motors and the battery is a 7.4V 1800mAh Lipo battery. I’m going to add this information to our review here. How long does it take to charge, I could not find this information. Full charge takes a few hours, that’s pretty standard for drones. 3-4 hours. They charging speed just isn’t very fast but that’s also what keeps the cost down. If they used high speed charging batteries you’d be paying a lot more for them.